Happy Thursday! So glad that the weekend is almost here! I have so busy this week that I have little time to catch up blogging! Hopefully next week things will calm down! This week our theme is cozy sweaters! Sweaters are one of my favorites! Giant sweaters and my favorite and oh so cozy! I picked up this sweater from Banana Republic for $12 dollars! I love finding great deals! Come share you sweaters with Elle and I! 1. 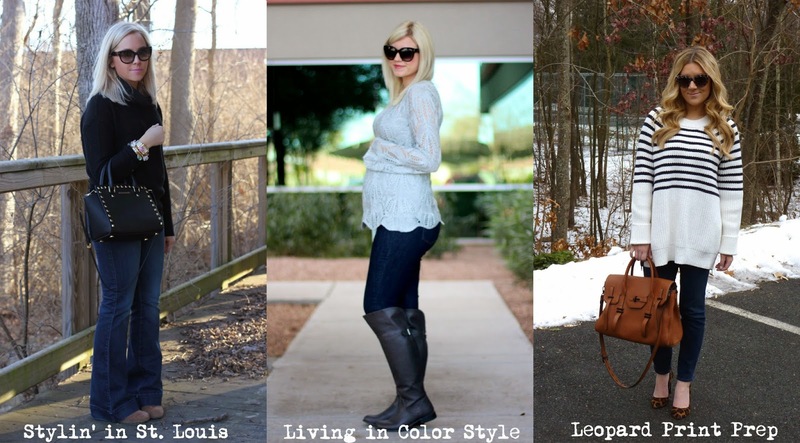 We kindly ask that you follow the two hosts: Elle from Living in Color Style and Jacqueline from Stylin' In St. Louis via Bloglovin or GFC and of course our co-host Stacy of Leopard Print Prep. Spotlight: Our spotlight this week is Crissy of Some Velvet Morning! Chrissy's bright pop of color really ties in this whole wintery look! Fuchsia looks amazing on her! Be sure to check out her blog! great casual look, love the flared jeans. Cozy sweaters are a must in my book! Adorable look!! Love your arm candy too!! $12?! That's an awesome score. You look super chic here, babe! Love the flares! We are so on the same page this week. I love the flares of the pants! You look so comfy and chic! Love the flares! love all the black and gold with the pop of color from the bangles! You can't beat a $12 sweater! What a great find. Happy to join the cozy sweater trend - yours look awesome & such a good deal!!! That MK purse is so pretty and goes with your bargain sweater nicely! I really LOVE those colorful bracelets, makes me think of Spring!! Yup cozy sweaters are an absolute must have for this time of year!! great look! I love a big bell on a jean!! very slimming and chic! Love your bag! Such a great classic look! Cozy sweaters are definitely a must for me in the winter! Love these! Nothing beats a cozy sweater this time of year! Such a cute & comfy look! So loving this chic and casual look! I especially love your arm candy and MK bag! Happy Friday!